Fiat is launching the new 500 Collezione in time for autumn. The special edition is dedicated to the season with exclusive combinations of colours and materials. For the commercial launch, Fiat has teamed up with L’Uomo Vogue, a key player within the international fashion scene for over half a century, for the new TV advertisement. Available in two versions, convertible and hatchback, with glass sunroof as standard, the new 500 Collezione has an exclusive style, courtesy of striking new liveries, such as two-tone Brunello, attractive pinstripe fabric interiors, “copper” finish wheels and chrome-plated “Collezione” badge on the boot lid. Today, the iconic Fiat 500 is as global as even – eight out of ten 500s are sold outside Italy. The 500, now in its eleventh year, once again broke its own record with some 142,000 units sold in Europe*, making these its best eight months ever. It is the leader in the A segment in Europe and is in the top three of the segment in 16 countries. More than six million units sold since 1957, more than two million in the last ten years. It keeps up with trends but never goes out of fashion. The uniqueness of Fiat 500 is also in this detail. Today, the car is appearing in a new package and it is as authentic and relevant as ever. After the spring special edition presented at the previous Geneva Motor Show, the new Fiat 500 Collezione special edition dedicated to autumn is being introduced in a world preview. 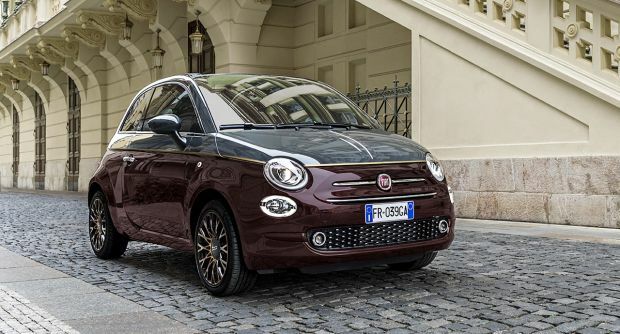 Once again, the new special edition of the Fiat 500 is celebrating the style, design, proverbial iconicity and inimitable personality of the timeless symbol of Italian elegance and creativity, capable of warming up even the chilliest months of the year. The feeling of warmth comes from the combination of colours, materials and details, which will win over anyone who wants to stand out with distinctive flair, loves cool looks and style without compromise. Modern and connected customers, who enjoy the fun, culture and scene offered by cities. Furthermore, the “New 500 Collezione, styled by L’Uomo Vogue” advertisement created by Leo Burnett and developed in partnership with the leading international men’s fashion magazine for the launch, marks the beginning of a fresh chapter in fashion and the coming together of two brands – Fiat 500 and L’Uomo Vogue – both making history in their respective fields. This is not the first time that 500 has dabbled in fashion. Its design has inspired artists and fashion designers, who have given it elegant, exclusive and sporty interpretations, creating memorable special editions and proving that such a well-loved, exciting, surprising car can bring together extremely different creative worlds. The many special editions include 500 by Diesel which was the first of a long series and was launched exactly ten years ago, 500C by Gucci in 2011, 500 Riva in 2016 and the 500-60esimo and Anniversario created to celebrate the sixtieth birthday of the iconic Fiat. Through these versions, Fiat 500 has turned traditional market rules on their head, demonstrating how a small car can express itself in multiple languages, all mutually different but united by success. Today, the new 500 Collezione is taking the place of the model presented in spring. Not unlike the most prestigious fashion houses, the 500 is also presenting two fashion collections to reflect the seasons. Available in two versions, hatchback with standard glass sunroof or exclusive convertible with grey soft top, the new 500 Collezione sports unique and original liveries, like the striking two-tone Opera Burgundy and Carrara Grey combo called “Brunello” that evokes the glamour of fashion and the colours of autumn. The car is also available with one-colour Opera Burgundy, Carrara Grey, Vesuvio Black paint jobs. The brand-new Cortina Grey is appearing for the first time on this special edition. The exterior lines are embellished by a chrome-plated moulding on the bonnet and by a copper-coloured beauty line, which matches the finish of the standard 16-inch alloy wheels. Finally, the elegance of the car is sealed by the cursive, chrome-plated “Collezione” badge which adds a stylish touch on the boot lid and reasserts the continuity of this model with the spring version. The interiors also hint to the world of fashion in the black and burgundy pinstripe seats with black vinyl top and 500 logo embroidered in burgundy. A copper-coloured line stands out on the dashboard in matching body colour to echo the exterior beauty line. The black mats are distinguished by the “Collezione” logo, also embroidered in burgundy. Style and elegance can be taken everywhere with the special copper colour key cover by Mopar® sporting the “Collezione” badge. Striking looks meet technology in the new 500 special edition which offers parking sensors and rain and dusk sensors as standard equipment to meet the demands of customers who desire comfort, practicality and safety. The equipment is designed to make daily driving easier and more comfortable. The new Fiat 500 Collezione also comes with a host of optional features, such as Uconnect 7″ HD LIVE radio, with Apple CarPlay integration and Android AutoTM compatibility, integrated navigation with TomTom maps, the largest 7″ TFT display in its category and Beats Audio Hi-Fi system for a premium listening experience. Finally, there are two E6D petrol engines to choose from – the tried and tested 1.2 69 hp engine, also available with dual petrol and LPG feeds, Dualogic robotic gearbox and paddle shift and the 85 hp TwinAir 0.9 cm3 engine. The campaign of the new Fiat 500 Collezione stems from the partnership between Fiat and L’Uomo Vogue. Both brands have always shared the same values of style, elegance and attention to detail. For over 50 years, the Condé Nast magazine has been the most authoritative voice in matter of men’s fashion. Like the icon of Fiat, L’Uomo Vogue has been leading the way for years, defining new trends in fashion, art and design, exporting Italian-made style worldwide and becoming an internationally acclaimed icon in its own right. L’Uomo Vogue is one of the few men’s magazines that can say to have accompanied, documented and in many cases influenced consumer choices and lifestyles for all these years – in Italy and worldwide, from Italy to the world. So, it is no surprise that the cover of “L’Uomo Vogue” was chosen to launch the new TV advert of the Fiat 500 Collezione styled by L’Uomo Vogue. The magazine shows the face of the model on the cover. His eyes and face start to move as if he were following something. The new Fiat 500 Collezione enters the room and the draft in its wake moves the pages of the magazine, stopping at the section dedicated to accessories. Attracted by the irresistible style of 500, clothes, design objects, watches and many other cult and trendy objects come to life and get into the car. After all, the iconic Fiat has always been a true catalyst for style and trends. And when the magazine closes, we see that the Fiat 500 Collezione has become the real star and deservingly owns the cover like the super model it is. The new Fiat 500 Collezione continues the happy tradition of the model presenting itself to the public in different and exclusive outfits. Remaining true to itself is one of the secrets of its eternal youth and of over ten years of enduring success. Today, the iconic Fiat 500 is as global as ever, with eight out of ten cars sold outside Italy. It is leader in the A segment, now in its eleventh year, confirming once again its dominance in Europe and ranking in the top three of the segment in no fewer than 16 countries in the first eight months of the year. The 500 once again broke its own record with some 142,000 units sold in Europe*, making these its best eight months ever. FCA Bank, the captive bank of Fiat Chrysler Automotive and Crédit Agricole Consumer Finance, supports the sales of Fiat brands by constantly providing innovative financial solutions, to make available to customers the best possible experience. Buyers of the Fiat 500, a car that has never gone out of fashion since 1957, will be able to keep up with new styles and designs with FCA Bank’s solutions. Thanks to special customized packages, such as PCP (Personal Contract Purchase) and Leasing, lovers of this iconic car will be free to choose, at every contract expiration date, the style of their 500 that best fits the season. Both financial structures are characterized by small monthly instalments and the possibility to choose, at contract expiration, whether to keep the vehicle, to return it or to replace it with a new one. All of FCA Bank’s solutions are suited not only for individuals but also for companies and independent professionals. In addition, there are also several competitive long-term car rental arrangements, through Leasys, for a driving experience with complete peace of mind. Moreover, FCA Bank makes available a wide range of insurance products that can be linked to the financing contract: personal protection services, such as the Protected Loan, which guarantees payment of part of a Loan in case of sudden and unpredictable events, such as a job loss, and car protection services. The financing and insurance solutions described are available in most European countries in which the FCA Bank Group operates. All the structures are extremely flexible, to meet local requirements.